In 1262 Isabella de Fortibus inherited the lordship of Carisbrooke Castle on the death of her brother, Baldwin de Redvers. She was a widow aged twenty-five and said to be the richest woman in England. Isabella made Carisbrooke the main residence of her far-flung estates and carried out many additions and improvements to the castle's private apartments. The hall range was extended, and she probably built the central part of the gatehouse. Today you can still see a window seat in the west curtain wall, while sections of her private chapel form part of the museum staircase. On her death in 1293, Carisbrooke passed to the king. 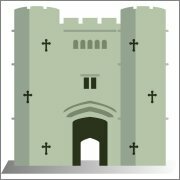 Admission tickets to Carisbrooke Castle are available when making a ferry booking online.